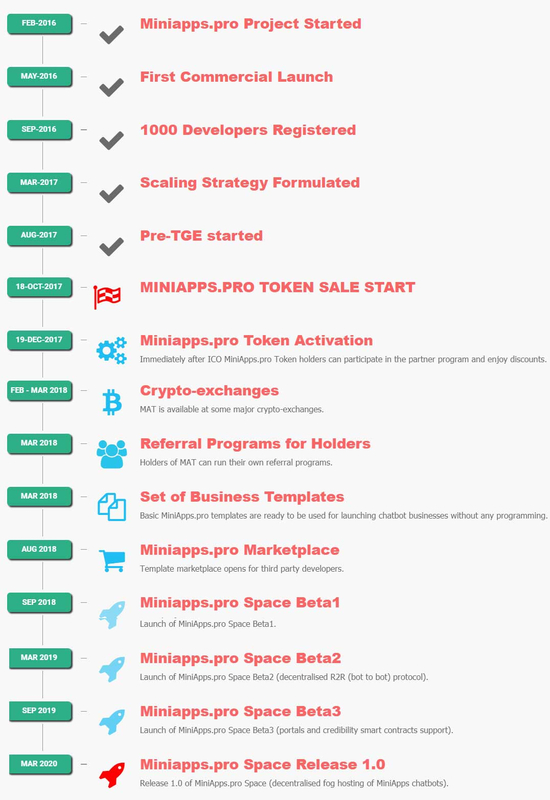 MiniApps.pro is the new generation chatbot platform built around the concept of decentralized network of template developers, clients, hosting providers and partners. It is a platform with API and web-constructor that enables quick creation and launch of mobile services and chatbots available via the Internet messengers and other channels like mobile web and USSD/SMS with support of AI technologies. Chatbots have already established themselves as efficient channel in many communication systems and proved their value for business. However, chatbot development requires multiple skills and resources most small enterprises do not have. MiniApps.pro goal is to aid small and medium businesses to integrate advanced Communication and AI technologies into their processes and benefit by expanding their market presence. Thank to MiniApps.pro, that reduces the costs of chatbot adoption and support, more than 100 million MSME around the world will get easy access to new generation of chatbots and improve the quality of their customer service. Unlike most startups, MiniApps.pro platform is a commercially proven product with several successful implementations in corporate market. 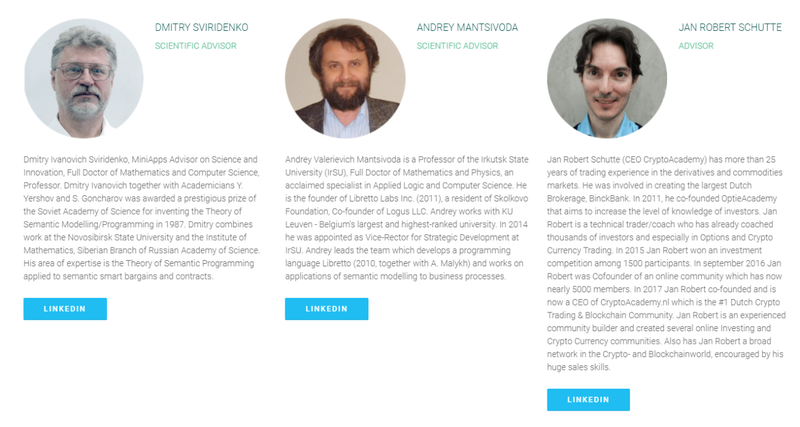 The token crowdsale is planned to gather funding for fast business scaling by building worldwide partners’ network, further product development and marketing of the platform focusing on MSME segments and emerging markets like India, South-East Asia, China, Russia, Africa, Latin America followed by expansion to advanced markets. MiniApps.pro tokens are ERC20 compatible Ethereum based smart-contracts. Tokens supply will be limited to 20 mln. PRWeb MiniApps, a Platform for the New Generation of Chatbots, Engages WINGS for Upcoming Token Generation Price Discovery and Social Engagement. Crypto-community and WINGS DAO members will be paid 1% of MiniApps tokens and 1% of raise for price discovery and promotion. 1. During the Token Generation Event, no more than 20 million tokens will be issued on the Ethereum platform as standard ERC20 tokens. 2. No more tokens will be issued after the Token Generation Event. Funds raised during the Token Generation Event will be kept in the multisig wallets, according to industry standards. The Miniapps.pro Bounty Program have started. If you want to paticipate in Translation activities, please submit your request by writing to [email protected] email. We have updated the Miniapps.pro core. The new release introduces replies to user's post (Telegram); forward of selected messages from a user to another chat or channel. A new powerful feature is bulk messaging: assign a phone number to a bot via its Settings and send messages on behalf of this number. This is being done via /notifyall command followed by a text. Bulk messages are sent this way through all channels to all users who communicated with the chatbot at least once after the current release. The stats of bilk messages are provided grouped by channels: Telegram, Skype, Facebook, Viber, USSD. We are opening the white list for those who wish to get a 10% bonus and pre-emption rights to buy the tokens. If you register with the white list, we will secure your pre-emption right to purchase the tokens for the specified amount. If you exercise your pre-emption right before the end of the white list program, you will get a 10% bonus on the purchase. If you fail to purchase the tokens reserved for you before the end of the white list program, your pre-emption right will be withdrawn, and the tokens will become available to the public. The white list program ends on 1st of November 2017. The strong points of MiniApps.pro platform are: support of all popular messengers, NLP engine, open API, visual bot builder, years of hard testing as a corporate solution. We are happy to announce finishing of token exchange between Miniapps.pro and ICOBox. As the result 165 holders of ICOBox Tokens now possess 88,225 Miniapps.pro Tokens (MAT). Dear Miniapps.pro public sale participants! We are announcing that we have signed an agreement with a strategic investor and business partner. This is a vital event both for the crowdfunding and the future of the Miniapps ecosystem. It will make Miniapps.pro even more profitable for its participants as well as for the entire crypto community. The crowdsale will be divided into stages, where the ongoing crowdsale is Phase 1 that lasts until December 19, 2017. In the beginning of 2018 we will launch Phase 2, which will be marked by the issue of a mineable coin based on a new blockchain. Those participants of the Phase 1 who obtain Miniapps tokens (MAT) before November 18, 2017 will have the opportunity to exchange them for Phase 2 coin with 75% bonus. Those participants of the Phase 1 who obtain Miniapps tokens (MAT) between November 19 and December 19, 2017 will have the opportunity to exchange them for Phase 2 coin with 50% bonus. The bounty program participants will have the opportunity to exchange their MAT tokens for Phase 2 coin with 50% bonus. Those participants of the crowdsale who obtain MiniApps tokens (MAT) before November 18, 2017 and who do not agree with the changes hereby introduced to the terms of Miniapps.pro public sale can get back the funds they exchanged for Miniapps tokens between December 19 and December 28, 2017. To do so, they have to send an e-mail to [email protected] from the address they used to register with Miniapps.pro. Then they have to confirm the ownership of Ethereum address they used to obtain MAT tokens. The last day to get 81% of bonus! We want to remind you that tomorrow 30 Nov 2017 is the final day to get 81% bonus. You can get as much as 81% of total bonus buying Miniapps.pro tokens (MAT). First, you get 8% bonus straight away. This bonus is credited to your account as soon as you send Ethers to the smart contract address. Second, you can get 50% to 75% bonus by exchanging MAT to KRK coin during the Phase 2, starting at the beginning of 2018. Note that KRK is a coin of another Ethereum based blockchain that you can mine. In the process of Miniapps.pro project further development KRK will form a blockchain for community tokenization featuring a simple and convenient chatbot interface and semantic smart contracts easily understandable by common people. If you purchase MAT tokens before December 1, 2017, you can exchange them to KRK with 75% bonus. Bonus of 50% will be applicable from 1 to 19 of December. Q: What bonuses are offered? Second, you can get 50% to 75% bonus by exchanging MAT to KRK coin during the Phase 2. Q: How can I exchange MAT tokens to KRK coin? You should register with https://tokens.miniapps.pro indicating your email and Ethereum wallet number where your MAT tokens are stored. Important! To be able to get Phase 1 bonuses, you should necessarily indicate the exact address from which you purchased MAT. On the start of the conversion procedure (the exact start time to become known before Phase 2) you will get a notification containing the address of the smart contract that you should transfer your MAT tokens to. After the transfer you will get an appropriate sum in KRK coins. They will be put into the same wallet the MAT tokens were transferred from. Q: How can I be sure I will get the bonuses upon the exchange? When we receive your MAT for exchange, we verify your wallet address and get to know the date you purchased your tokens. If the date of the purchase (the earliest purchase is taken into account) is earlier than 1st of December, you get 75% bonus; if it is between 1st and 19th of December, your bonus is 50%. It means that the bonus is attached to your wallet. Q: What if later I add some tokens to the wallet with 75% bonus assigned? Assume, you made the first purchase before 1st of December and entitled to claim 75% bonus upon the exchange. If later you purchase the tokens and add them to the same wallet, you still can exchange them with 75% bonus. Even after the end of Phase 1 you still can purchase the tokens (e.g. through EtherDelta exchange) and add them to your wallet to get 75% bonus. In other words, the bonus is firmly attached to your wallet and does not change, no matter how many MAT are in it. Q: What is the rate of exchange of MAT token to KRK coin? 1 MAT = 0.01 ETH during Phase 1. It means that in Phase 2 you can use 1 MAT as equivalent of 0.01 ETH and get the relative sum in KRK. In Phase 2 KRK rate is estimated as 0.0001 ETH. It means that you can exchange 1 MAT to 100–175 KRK depending on bonuses. Last week of 54% bonus for MiniApps.pro crowdsale! You can still purchase MAT tokens to exchange them for KRK coin with 50% bonus. We are developing Next Generation Blockchain to make tokenization and smart contracts simple. Why do we need new KRK coin? It will help make tokenization simple for everybody. Which means new marketing tools for business and any community. You can build your own tokens in minutes with templates and visual editor. Why KRK is better than MAT? ​​​​​​​ KRK provides same functionality as MAT, plus it is a mineable coin which gives easy way to create new tokens. Does MAT have any value other than its exchange for KRK? MAT is partners tokens for miniapps network and will have this status in 2018. Both MAT and KRK will be available on crypto exchanges. Join blockchain revolution with big bonuses only before Dec 19th.